From Cascade, Colorado turn south at the signs and proceed to the toll gate. Pentax K-1, Pentax 28-105 Zoom Lens, Tristar Circular Polarizer, ISO 100, 1/30 sec., f10, 48 mm Focal Length. After an early morning drive to the top of Pikes Peak on 16 July 2017 to photograph the sunrise, I stopped by Crystal Reservoir on the way back down and captured this image at about 7:30 AM. 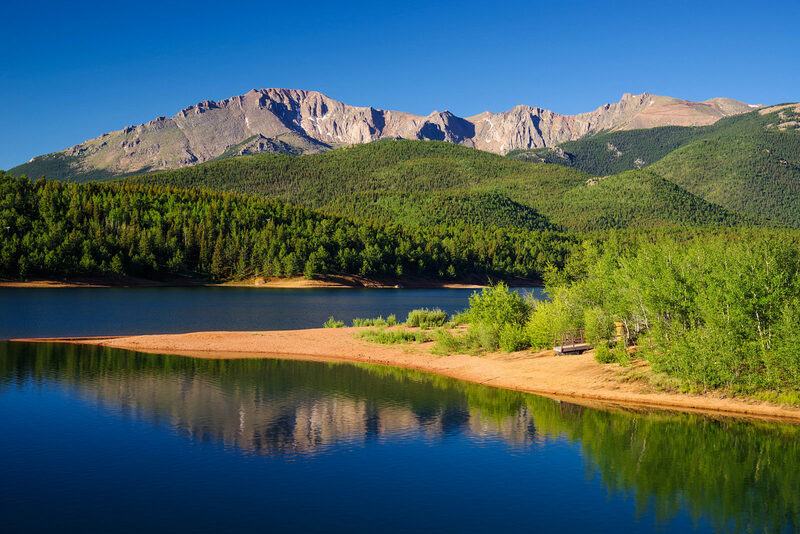 One of several reservoirs that supply water to the city of Colorado Springs, Crystal is a favorite stop of mine whenever I drive the Pikes Peak Highway. The wind on top of the Peak was constant and moderate but at the reservoir it was light and intermittent. Therefore, there were a few ripples in the water.